As goalkeeping continues to be reinvented, the most recent changes have come in the aerial ball. Today’s keeper sees more hard, lifted shots from different angles than ever before. Fortunately, he is better equipped and has new tools and skills for meeting the task. No offsides, drag flicks and reverse stick chips have increased the number of chances above the waist that a keeper has to defend. Upper body pads and hand protectors now give him effective protection to make those plays. A couple of notes about equipment, I’m for it, especially upper body pads. 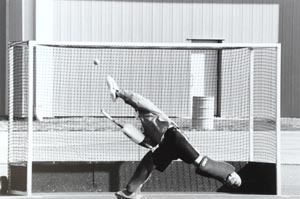 A lot of times today’s keeper is getting hit by a hard ball when making a save. That’s not a whole lot of fun if you don’t have protection. Yeah, you do have to figure in mobility, but I prefer protection over mobility. I wear an ice hockey body pad. Some people like ice hockey body pads less. There are a wide variety of makes and models. I think you have to look at how you play and where you’re getting hit and make your decision accordingly. The days of gloves are coming to an end. Hand protectors are much more protective than gloves and offer you a new range of skills to defend. umw webmail High density foam and functional engineering have opened up doors for the keeper to clear with his hands, much the same way that foam kickers allowed the keeper to use his feet. He can use the rebounding and protective qualities of foam to play a ball, rather than be played by it. What you can do with your hands is profoundly effected by how you hold your hands in your ready and moving positions around the goal. Ready and moving positions or stances are distinct. When a keeper has to move big distance, he’s running and arms are pumping. When he needs to cover three yards on a side shuffle while a forward pulls right, he’s trying to make himself big while covering the ball and moving, all at the same time. He does that by keeping his hands outside his shoulders and slightly forward from his sides. He does that by being balanced, quick footed, with his weight forward. If a forward shoots as you’re moving, getting hit with the ball is a success. Total ready position is when you have a forward striking from the top of the circle and you’re able to react and save/clear. I don’t think hand protectors have radically changed the way I am in my basic ready position/attack stance. I keep my hands in front of me, stick held about two/fifths down the length. I want to position myself at a distance from where I can react and position myself to clear the ball. For me, that’s probably 11 yards or 10 meters from the shooter. That distance is really going to vary because it depends on where each individual keeper is most comfortable and effective playing the ball. I will change how I hold my stick according to the situation. My needs are going to be different when taking on a forward running the baseline with passing options, than say, the forward alone at the penalty spot with a bouncing ball in front of him and time and space to tee off. If somebody has the time to hit/chip a shot, I don’t want the ball to carom off of me because I was too long on my stick, hence two/fifths. While not exactly textbook, this is where I like to take the ball on my stick. The ball has hit the stick mid-shaft and is headed around the post. As evidenced by the legs in the foreground, this is a chip shot from close range. I don’t think we’ve reached the limits of what can be done with hand protectors, but among the skills and changes that have developed are the keeper being able to deflect a shot with his hands. On the stick side, the facing surface is a deflection surface. I think that’s one of the great design features of the Robo RHP, you have a big, flat, deflecting surface. Some of the more flashy, round, right hand protectors are functionally difficult. With the Robo RHP you’re protected comfortably and effectively taking the smashing hit straight on the hand or making a reverse stick tackle and being able to get your stick down. On balls to my stick side, I like to play them close to my hand. That means for me figuring early on whether the ball is going to be one that I will play with my right hand. If the ball is reachable, I prefer to cross over and take it with my left hand and that still depends on where’s going to be a safe space for me to save/clear to. How my shoulders are set effects how I can play a ball and to where. Just as I need to open my hips kicking the ball, I need to open my shoulders when I play the ball with my hands. 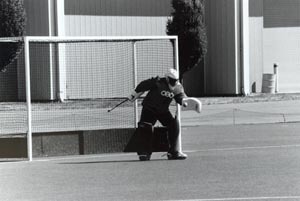 If the ball is to my stick side and far enough that I can’t reach it with my left hand, I try to take the ball on my hand protector. With the big, flat surface and the rebounding qualities of foam, I can deflect the ball into space. If I have to use my stick to make a save, I like to take the ball mid shaft. I don’t wave at the ball when making the save. Because I play with my hands in front in my ready position, I have to open up automatically. On my stick side, that really allows me to angle my body back to put balls to the side as well as giving me a little more time to see the ball. Whatever way you play, the tiptoe of your stick should never be considered a primary stopping surface. Going back to the ball hit to my right hand that I can cross over and play with my left. If I drop my right shoulder, come forward with my left shoulder, angling my left hand while I bring it back, I can deflect a shot with pace, wide right to safety. In the old days, you had to stop the shot dead, drop it and hope someone wouldn’t kill you while you tried to clear it. If you didn’t do those things in just the right order you could bet it was going to be at least a corner. Your left hand becomes your primary aerial deflecting surface. We talked about bringing your left hand across for saves to the right, obviously it’s pretty much the only option on shots to the keeper’s left. You can use the pace of the ball to deflect it to space and safety and that’s something you couldn’t do with gloves. There are a couple of things I like about the Robo LHP, it’s big, bulky and functional. There’s a nice sweet spot. Taking the ball to his right, low; notice hand angle, shoulder and leg position. There’s a lot of preparation to making a clear. One of the things that’s happened since hand protectors came on the scene is that keepers have been allowed a fair bit of freedom in deflecting/parrying the ball. Obviously a keeper still can’t bat the ball, but if you’ve got to bring your left hand across your body while reaching/falling/jumping, that ball has got some zip as it comes off your hand. We can use zip to our advantage. We do that when we move our whole body to the ball when we use our hands, rather than just reach. 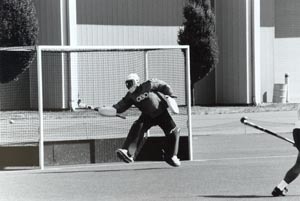 When you reach and deflect a ball, it often appears that the keeper is batting the ball. When you get your body to the ball, you keep your hand and forearm set up early so that you can deflect and then get your body there to make the skill. I think your legs are really important when you make hand saves. Footwork is still critical because it dictates body position. There’s no point in worrying about the skill to use at point A if you can’t get there. When you get your body to the ball, you need to get your hand and forearm set up early so that you can deflect the ball, as opposed to batting it. You want to “sell” your deflection to the umpire with body movement rather than arm movement. Taking the ball to his right, high; notice again the hand angle, shoulder and leg position. With hand protectors, hard shots have become easy. Too often a ball without pace is more difficult for the keeper. In such cases a keeper still needs to be able to execute the basics-stopping the ball and controlling it into a safe space-than quickly clearing it. You need to know where the ball is going off of your hands. Slower paced shots require the keeper to execute a multi-part skill with power and precision. That skill requires co-ordination which comes with repetition. I like to take my left hand back if I’m trying to control/cushion a shot to keep it close to me. I need to stay up on the balls of my feet as I’m taking the ball so I can come forward when making my clear. If I don’t, I have no power, no extension, I’m flat footed and typically reacting to the ball hitting me. Controlling the ball down to clear. Notice the hand and head position. The keeper is over the ball, legs ready to take it to space. The ball will not deflect itself to safety by itself with hand protectors. Learning how the ball rebounds off your hands is part of the process. The process comes through training and repetition. Tennis balls are good. Get someone to help you out with a tennis racquet and balls. Have them set up around the top of the circle and whack tennis balls to your hands. You don’t need to be in full kit, get your helmet, hand protectors, stick and pelvic protector and just take balls. Whether it be a hockey ball in full kit, or tennis ball in light gear, a keeper needs to learn through experience where balls will rebound to. That means taking a lot of balls. Notice how the keepers body and hands are set up when he is able to play the ball safely in to space. You can do the same with a Jugs machine, or a couple of shooters and work chips and flicks. Take note of how ball speed and rebound are related. Try to deflect balls to places. Hand protectors have really opened up the doors for what a keeper can do with aerial balls. Tools without skills are useless. If we don’t use hand protectors properly we’re back to being the wall, put anything above our waist and we’ll give it right back to you. That didn’t work so well. We have a better way, we just need to master it.